Analysts see this month's re-opening of an air link between Tehran and Caracas as the latest evidence of Iran's growing role alongside Russia and Cuba in bolstering the multilayered security apparatus keeping Venezuelan President Nicolas Maduro in power. "Unless Iran has suddenly become a source of tourists, this is another reason why the regime of Maduro has become a threat to the security of the U.S.," tweeted Senator Marco Rubio, who has major input into the Trump administration’s Latin American policy. Spokesmen for Iran’s civil aviation organization have told the official Mehr news agency that the Mahan airliner carried high-level foreign ministry officials and airline executives. IRGC Quds Force officers have worked with diplomatic cover at Iran’s large embassy in Caracas, providing intelligence and other assistance to the Venezuelan government, according to Pentagon reports. The United States imposed sanctions on Mahan Air in 2011, saying it provided financial and other support to Iran’s Islamic Revolutionary Guards, which the State Department designated as a terrorist organization last week. France and Germany banned the airline’s flights earlier this year, accusing it of transporting military equipment and personnel to Syria and other regional war zones. Iran operated regular flights between Teheran and Caracas with stopovers in Syria’s capital Damascus about 10 years ago, when the two governments were exchanging state visits and signing a series of cooperation agreements. The flights were suspended after the U.S. voiced suspicions about passengers and cargo being offloaded at a special VIP section of Venezuela’s Simon Bolivar airport with no customs or immigration checks. Venezuela and Iran have joint military ventures including the manufacture of munitions and surveillance drones, according to Venezuela’s ex-defense minister Raul Baduel. Opposition sources say Iran has also negotiated mining concessions to tap Venezuelan uranium deposits and that some samples were flown from Caracas to Teheran by way of Damascus in 2010. 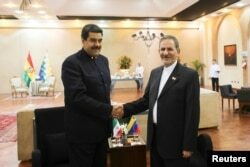 Venezuela's President Nicolas Maduro (L) shakes hands with Iran's Vice President Eshaq Jahangiri as they meet during the 4th Gas Exporting Countries Forum in Santa Cruz, Bolivia, Nov. 24, 2017. The administration of President George W. Bush formed a special unit to investigate Iran’s activities in Venezuela, according to it’s director David Asher, who told the U.S. Congress that President Barack Obama disbanded his team for fear that its findings could jeopardize negotiations to curtail Iran’s nuclear program. According to U.S. intelligence agencies, top officials of Maduro’s regime have close connections with Lebanon's Hezbollah militia, which is designated as a terrorist organization by the United States and other countries. Hezbollah enjoys Iranian support and is fighting in Syria’s civil war on behalf of President Bashar al-Assad. Maduro’s former vice president Tareck El Aissami is under U.S. indictment for funding Hezbollah with proceeds from a Venezuela-based drug trafficking ring. He met in Syria last week with Assad, according to Venezuelan state media, which quoted him as saying there were “similarities” between the conflicts in Syria and Venezuela. El Aissami played a key role in dismantling a coup plot against Maduro last year when he ordered the arrest of almost 100 army officers. He has also organized paramilitary “colectivos” to silence the opposition, arming them with Iranian-made 5.56-mm compact versions of the Russian AK-47. A Venezuelan colectivo leader of Lebanese origin, Ghazi Nasr al Din, ran a paramilitary training and recruitment center out of a gym in downtown Caracas. He is on the FBI terrorism watch list for “facilitating the travel of Hezbollah members to and from Venezuela.” He has also traveled as a diplomat to Syria and Iran. “!ran is playing a far larger role in designing Venezuela’s security structure than is commonly known,” says James Humire, a Washington-based policy analyst and author who lectures on Latin America. Retired Venezuelan National Guard brigadier Marco Ferreira has told VOA that some of the passports were issued when he worked at the interior ministry’s immigration office under the supervision of Cuban security advisors. He said one reason for establishing the Iranian air link was to facilitate the movement of suspect nationals from Middle Eastern countries. Rear Adm. Touraj Hassani Moghadam, Iran's deputy head of naval operations, told the Meher news agency in December that the navy wants to send a flotilla equipped with “special helicopters” on a five-month mission to Venezuela.